Accuweigh recently hired out a portable weighbridge to a waste management facility in Western Sydney. The 12-month weighbridge hire package also included a traffic light system, ticket printer and a weighbridge software package. 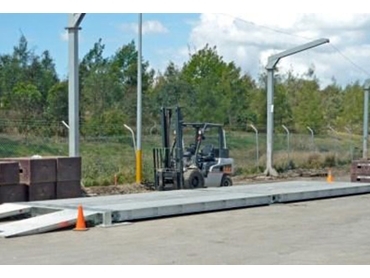 Accuweigh’s portable weighbridge for hire has a 12-metre long, low profile steel deck split into two 6-metre long sections for easy relocation. Six heavy duty load cells support the weighbridge deck with the centre cells positioned under the joining section to increase the weighbridge’s weighing capacity. Heavy duty galvanised ramps are positioned at both ends of the hire weighbridge to provide easy truck access. All metal work is securely located into the existing level hardstand by Chemsets. This particular weighbridge is configured for non-trade use as it is only being used for reconciling internal payload data. However, Accuweigh hires out portable weighbridges with full trade approvals if the proposed site meets government regulations. The customer also has the option to purchase the portable weighbridge and associated equipment outright after the nominated hire period. Australia’s leading industrial weighing company, Accuweigh operates branches in all mainland states supplying scales and weighbridges for short term and long term hire.